Is it September already? Where did the summer go? Oh wait, we didn’t get a summer! As much as summer was disappointing this year, I’m glad fall is slowly encroaching upon us. The fall colours, the harvest, the cool, crisp air--it’s perhaps my favourite season, and the cooler weather always brings to mind warm comfort food. I couldn’t help picking up some beautiful sausages at the farmer’s market the other day, and with some sauerkraut sitting in my pantry, it was time to whip up a batch of sausages and sauerkraut. Sauerkraut is a bit of an acquired taste if you’re not used to it. It is a type of fermented cabbage, and because of its fermentation, contains a number of lactic acid bacteria, vitamin C, and other nutritional benefits. I was introduced to sauerkraut at a fairly young age, so I never had a problem with it, although I have known others who are put off by the smell and taste. 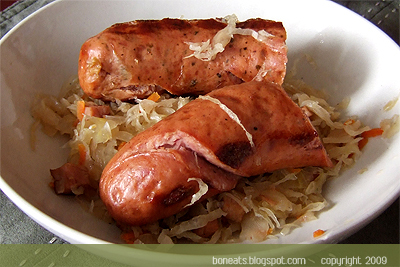 Cooked with some bacon, sausages and apples though, the sauerkraut absorbs the smokiness and savouriness of the sausages as well as the sweetness of the apples, making for a delightful combination of flavours. I also find that it’s the perfect accompaniment to sausages, as the sweetness and sourness of the sauerkraut cuts the saltiness and fattiness of the meat. I didn’t have all the ingredients in my pantry to make a traditional choucroute garni, but here’s my adaptation for quick and easy sausages and sauerkraut. Prevent oven to 350°F. Heat some olive oil in a heavy ovenproof pan over medium heat and brown the sausages, about two to three minutes per side. Remove the sausages, add the onion and bacon and cook until the onion is translucent and the bacon crispy, about 5 minutes. Add the remaining ingredients and bring to a simmer. 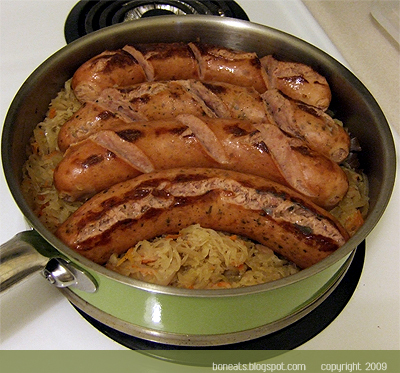 Place the sausages on top of the sauerkraut, cover the pan and bake for 40 to 45 minutes. 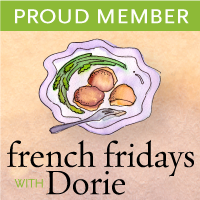 Serve immediately with Dijon or whole-grain mustard and fresh bread.